In the last few articles, we've discussed different Text functions - those that are used to manipulate text strings. Today our focus is on the RIGHT function, which is designed to return a specified number of characters from the rightmost side of a string. 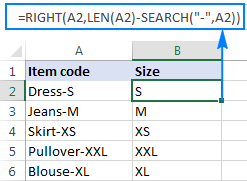 Like other Excel Text functions, RIGHT is very simple and straightforward, nevertheless it has a few unobvious uses that might prove helpful in your work. 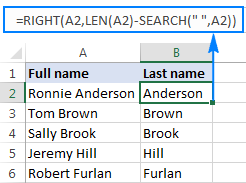 The RIGHT function in Excel returns the specified number of characters from the end of a text string. Text (required) - the text string from which you want to extract characters. Num_chars (optional) - the number of characters to extract, starting from the rightmost character. If num_chars is omitted, 1 last character of the string is returned (default). If num_chars is greater than the total number of characters in the string, all characters are returned. If num_chars is a negative number, a Right formula returns the #VALUE! error. Important note! 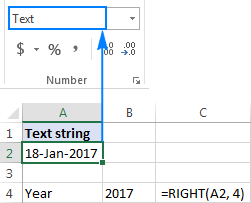 The Excel RIGHT function always returns a text string, even if the original value is a number. To force a Right formula to output a number, use it in combination with the VALUE function as demonstrated in this example. In real-life worksheets, the Excel RIGHT function is rarely used on its own. In most cases, you will be using it together with other Excel functions as part of more complex formulas. In case you want to extract a substring that follows a specific character, use either SEARCH or FIND function to determine the position of that character, subtract the position from the total string length returned by the LEN function, and pull that many characters from the rightmost side of the original string. As you can see in the screenshot above, Column A contains a list of errors. Your goal is to pull the error description that comes after the last colon in each string. An additional complication is that the original strings may contain different numbers of delimiter instances, e.g. A3 contains 3 colons while A5 just one. To make sure the formula works right, you can enter it in a separate cell, and the result will be 2, which is the number of colons in cell A2. Replace the last delimiter with some unique character. In order to extract the text that comes after the last delimiter in the string, we need to "mark" that final occurrence of the delimiter in some way. For this, let's replace the last occurrence of a colon with a character that does not appear anywhere in the original strings, for example with a pound sign (#). In this example, the formula returns 10, which is the position of # in the replaced string. Apart from extracting a substring from the end of a string, the Excel RIGHT function comes in handy in situations when you want to remove a certain number of characters from the beginning of the string. Can the Excel RIGHT function return a number? 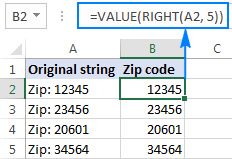 As mentioned in the beginning of this tutorial, the RIGHT function in Excel always returns a text string even if the original value is a number. But what if you work with a numeric dataset and want the output to be numeric too? An easy workaround is nesting a Right formula in the VALUE function, which is specially designed to convert a string representing a number to a number. Why doesn't the RIGHT function work with dates? Since the Excel RIGHT function is designed to work with text strings whereas dates are represented by numbers in the internal Excel system, a Right formula is unable to retrieve an individual part of a date such as a day, month or year. If you attempt to do this, all you will get is a few last digits of the number representing a date. Supposing, you have the date 18-Jan-2017 in cell A1. If you try to extract the year with the formula RIGHT(A1,4), the result would be 2753, which is the last 4 digits of number 42753 that represents January 18, 2017 in the Excel system. There is one or more trailing spaces in the original data. To quickly remove extra spaces in cells, use either the Excel TRIM function or the Cell Cleaner add-in. The num_chars argument is less than zero. Of course, you will hardly want to put a negative number in your formula on purpose, but if the num_chars argument is calculated by another Excel function or a combination of different functions and your Right formula returns the #VALUE! error, be sure to check the nested function(s) for errors. The original value is a date. If you have followed this tutorial closely, you already know why the RIGHT function cannot work with dates. If someone skipped the previous section, you can find full details in Why the Excel RIGHT function does not work with dates. This is how you use the RIGHT function in Excel. To have a closer look at the formulas discussed in this tutorial, you are most welcome to download a sample Excel RIGHT function workbook. I thank you for reading and hope to see you on our blog next week. 31 Responses to "How to use Excel RIGHT function - formula examples"
condition : between A and B, who reach 7 first in period of time 1 to 6, then win. Hope this will solve your purpose.. Excellent site. Always come to you for answers, and you always have them. Thank you. Thank you very much, that formula did the trick. I am using the following formula to produce a number that is in turn used to produce a list of items 1 - 20 for 131 staff. Any help would be appreciated. It appears RIGHT is extracting the text but 10 is seen as 0 and 11 as 1 and so on. Hi, I have a form in excel which shows a value in a cell of 806.73 (example in field A1). I want to to show each digit in a separate filed i.e 8 goes into A1, 0 into B1, 6 into C1 etc. 3. Just select the cell where you've entered the formula and drag the fill handle (a small square at the lower right-hand corner of the selected cell) to the right. always the data comes in the above formate; I want to use conditional formatting in case the first digit > the last digit. I work with excel sheets with up to 300 lines of different text in 1 column and need to create a comma delimited csv file which requires a minimum of 2 commas in each line. Some lines don't have the 2nd comma at the end of the text, how do i go about adding a comma in the cells that are missing the 2nd comma? Essentially i just need to fine all the cells that are missing a comma at the end of the text and add it in but i haven't a clue how. There may be other methods, but this is how I would do it. I would start by taking the comma off the end of the data so that the data would have the same structure. Then apply one procedure to all the data. This should remove the second occurrence of the comma and leave the other comma in place. Copy this formula down the list to the end of the data. Now, all the cells have the same structure with one comma in the data, none at the end. Second, in a new column say cell “C1”, enter =B1&","
This enters a comma at the end of the text from B1. Then copy down this formula to the end of the data. When you finish, there is one comma in the data and one comma at the end of the data in column C.
Lastly, you may want to copy the completed data into a new sheet. If so, copy the data, then in another sheet use “Paste Special – Values”. This will copy all your data with just one comma in the data and one comma at the end ready for a CSV. But i didn't explain myself correctly i dont think... so in fear of miscommunicating my issue again here is an example. 90% of the lines have an open bracket which is the start of the description so i use find and replace to find the first ( and replace it with ,( which is simple enough to get my second comma. The part im not getting right is to find all the rows (the list is growing... now up to 400 rows per csv) that don't have the open bracket and add a comma at the end of those lines. But i'm not sure how to find cells that don't have 2 commas and add a comma to those that only have 1. I am unable to find the solution for following query, please help me finding the solution. I want to generate a formula for saving a number to a particular bit column, my table has 9 columns 1,2,3,4,5,6,7,8,9,0 if user input value 20 it should be save in bit 2 column, if user enter value 75 in cell it should be save to column no 7. So guys please suggest me solution and yes i am totally newbie to excel so please give me exact formula to do so. "123 Westlawn Unit 134 Los Angles, CA 90066 USA"
"567 Homecoming Dr. #1267 Chino, CA 91708 USA"
I need to Pull City, State and Zip or at least State and Zip. I do not need USA part. Because I can't see any pattern to the structure of your data, it seems you'll have to handle some of the separation process "By Hand". In other words I don't see any option but for you to clean this data up. Highlight the cell that contains the data. Then from the Data tab select Text-to-Columns. Then click the Delimited button then next. Then click the Spaces button then next. Now your data is in separate cells. Problem will be the same type of info is not in the same columns. You'll have to move the same types into the columns by hand. If you need to put the name state and zip into one cell you'll need to concatenate them into one cell. how do i include the "0" ? Is the data in Text format or Number format? I can't figure out how to return the last two digits of the number with the trailing zero. Any ideas? I cant figure out the right formula. Alternatively, you can use our Extract Text add-in to derive the necessary part of your cell in a few clicks. The add-in is included in our Text Toolkit for Excel that contains 8 useful add-ins to manage text data in Excel (remove extra spaces, substrings and non-printable characters, change case, split cells, etc.). Feel free to install a fully functional 7-day trial version of Text Toolkit to see the add-ins work. Here is the direct download link. How do I extract the last 2 digits from a date and also add two digits to make an actual date? For example, I was given 925085/15, I need to extract the 15 and include 20 in front of the 15. I used this formula =RIGHT(A4,2)&"20" and I got 1520 instead of 2015? How can I tell the formula to count "0" as part of the number? Taking into account that not all the number's in cell D18 have "0"'s (ex: my D18 cell can be 10.85, in this case the right formula works perfectly). what formula can I use to get the tld only ? Where A2 is the cell containing the original domain. Hi, anyone could help with the below example ? How I use the right function formula can get with the L no I need in one column I can fill in 2 type of different data.